Home > Trivia	> Willit Run? Some time ago we visited the Smithsonian’s National Air and Space Museum on the National Mall in Washington, D.C. I had to smile when I saw the name of the North American P-51 Mustang on display there. 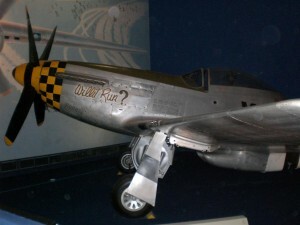 The P-51 is named “Willit Run?”, but the nose art on this plane is not talking about this particular aircraft or any P-51 for that matter. It’s an inside joke of WWII vintage. During WWII, as in every big war, private industry is called upon to produce war goods rather than civilian goods – “guns vs. butter”. 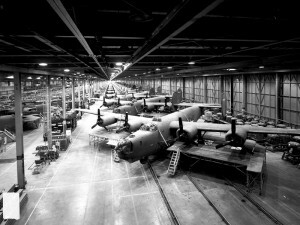 Henry Ford took on a huge project to contract-build Consolidated B-24 Liberator bombers in a new state-of-the-art manufacturing facility to be built on a farm which Henry Ford owned at Willow Run near Detroit. The facility was to be a prime example of Roosevelt’s “Arsenal of Democracy”, conceived and built on an unprecedented scale. Begun in April, 1941, it was the largest enclosed room in the world, with 3.5 million square feet. But Willow Run had a long and troubled construction and start-up time. So long and troubled a start-up, that after two years with little results the public became disillusioned with the project and derisively nicknamed the plant “Willit Run?”. Ford persevered however, and Willow Run finally hit its stride, eventually producing at the prodigious rate of 650 B-24 bombers per month by August, 1944. At war’s end, Willow Run had produced about half of the 18,000 B-24’s which saw service in the war.